Cradle of Champions follows three extraordinary, inspiring individuals—James Wilkins, Nisa Rodriguez, and Titus Williams—on an urban odyssey through a ten-week tournament, founded in 1927, that has produced more professional world champions than the Olympic Games. Telling a compelling story of dreams, heartbreak, and redemption, the result is a unique work of art. 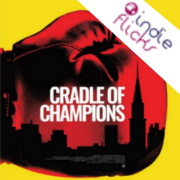 Cradle of Champions is edge-of-the-seat drama with the polish of a Hollywood feature film and the intimacy of a gritty cinéma vérité classic. About the filmmaker: Bartle Bull (Director/Producer) is an author, journalist, and filmmaker who has contributed many times to national newspapers such as the Wall Street Journal, New York Times, and Washington Post, as well as to numerous magazines and television and radio programs. Cradle of Champions is his first film. He is currently working on a screenplay about the murder of the great American architect, Stanford White, in 1906. Recommended for ages 13 and up. All patrons entering the theater must have a ticket regardless of age. SMDCAC 18/19 subscribers enjoy complimentary tickets to the screening. Contact the SMDCAC Box Office for details.